How much do you love Metro? Sure, you have every commemorative farecard, you’ve got both the Nationals SmarTrip AND the Barack Obama SmarTrip card. You even dressed up like a Metro pylon for Halloween. But, do you have the shower curtain yet? No shower is complete without the Metro Shower Curtain. It’s an easy $30 gift for that friend of yours that you once caught looking a little too intently and longingly at the station manager at Chinatown/Gallery Pl. We’ve worked out a giveaway with the manufacturer, Izola Shower Curtains. Enter a comment, and include your email address in the form, and we’ll pick a winner at noon tomorrow. But will looking at this in the morning make me as motion sick as manual braking? This would be perfect for our out of town guests to be able to study. excuse me, is that your “bag”?? WANT! Perfect for when I need to contemplate the miserable commute that awaits me while showering. This could be therapeutic. I agree, I’ll have to find a SmarTrip bathmat to go with! I wonder if the shower curtain also contains updates on weekend track maintenance? This would be awesome to show to guests, it would make a great conversation piece! That is so awesome!!! Would love to win! Oh, how awesome is that! I would love it! This is the coolest! I’d love to win one! Awesome. My fiance would love it! This a little excessive. Just up my alley! Or, we could take the Green Line? My roommate and I are obsessed with Metro. This would be perfect for our apartment. I have a friend who is moving to the area soon, this would be the perfect house warming gift. I literally gasped out loud when I saw this. So exciting! 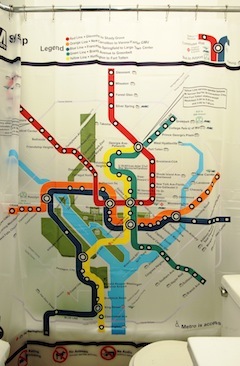 Given that I spend at least a few minutes a day staring intensely at anything within eyesight (yeah, in that bathroom), owning this shower curtain will make me a walking metropedia. Yeah, give it to me. I took one of the sample metro maps they have available to visitors at the university admissions office just to display in my room. This would be way cooler…because I was so cool doing that before. This metro map will be a good go-between to help me decipher welovedc.com and greatergreaterwashington.com’s analyses of peak ridership comparisons between orange/blue and red lines, since I’m only familiar with the one line I use every day. Sweet, now I know what my roommate is getting for x-mas. My roommates would hate me forever, but I’d love to shower behind this thing. Awesome!! WMATA should be capitalizing on this stuff to raise more revenue.